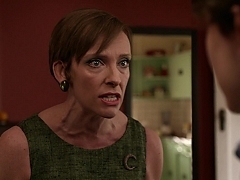 Peter (Alex Wolff) gets into a heated argument with his mother (Toni Collette) over der dinner table. 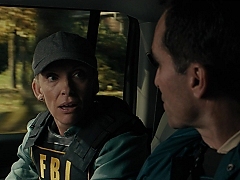 Annie (Toni Collette) talks about the stress she is enduring after the passing of her mother at a self-help group. A montage of how scientists Ben (Matthew Goode) and Katherine (Toni Collette) raise their three children for a scientific project. Wendy (Dakota Fanning) is getting into an argument with her sister Audrey (Alice Eve) while Scottie (Toni Collette) has an eye on them. Wendy (Dakota Fanning) asks Scottie (Toni Collette) to read her finished "Star Trek" movie script. 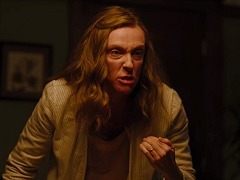 Scottie (Toni Collette) and Wendy (Dakota Fanning) go through Wendy's daily schedule from home to work and back. Nate (Daniel Radcliffe) informs his FBI team about the deadly plan he is about to execute. Angela (Toni Collette) and Nate (Daniel Radcliffe) share information on the party guests he has spent the day with. United again, the Engels watch in horror as they see and hear what happens on the floor above them. 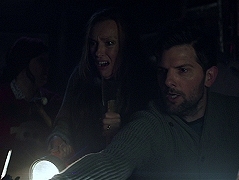 With the family being split up, Tom (Adam Scott) and Sarah (Toni Collette) make a horrible discovery in the attic. 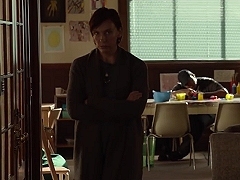 Sarah (Toni Collette) goes to lengths after her nephew is being forced into the chimney by some evil gingerbread men. After an evening of drinking, Jean (Toni Collette) recollects memories of her alcoholism and John's father. In order to convince Jean (Toni Collette) for a stay in rehab, John (Jack Reynor) decides to drink with her. John (Jack Reynor) tapes his mother's (Toni Collette) outburst and rage his with phone to show her afterwards. 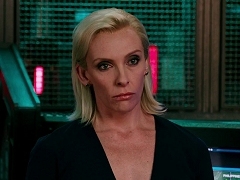 Professor Coreman (Christopher Plummer) tries his technology on emotions with Hector (Simon Pegg) and Agnes (Toni Collette). Greg (Nat Faxon) is being left by Missi (Toni Collette) for Tammy's horrible boss (Ben Falcone).